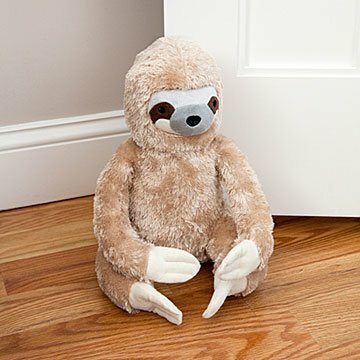 Adorable, and oh-so-courteous, this super-soft sloth is happy to hold your door open. This little sloth is such a slow, imaginitive wanderer he got left behind by his pack. Maybe he can join your crew? The super soft, South American helper with a sand-weighted bottom makes a delightful doorstop. He also appreciates pets and the occasional cuddle. An adorable housewarming or birthday gift for animal lovers, the little guy will be oh-so-grateful to have a new crew. Spot clean. Made in China. I am so in love with Sloth's! So obviously when I saw this I bought it. When I received it I was surprised at how big it was, the picture doesn't do the size justice, and it's cuter in person. But the quality isn't as nice, when I pulled it out there's a hole in the back. It's a couple days later and I turned it around and found a hole in the armpit, so either it's poor quality, or one that was sent back.